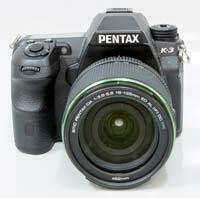 The flagship Pentax K-3 is a new semi-professional DSLR camera. Key features of the K-3 include a 24 megapixel APS-C sensor with an anti-aliasing simulator rather than an optical anti-aliasing filter, 27-point Safox XI AF module that remains operational down to -3EV, 86,000 pixel RGB light-metering sensor, ISO range of 100-51,200, Full HD 1080p video at 60fps, 8.3fps continuous shooting, High Dynamic Range mode, and a range of in-built digital filter effects. The K-3 offers a dustproof, weather-resistant and cold-resistant construction, a shutter designed for 200,000 releases, top shutter speed of 1/8000th second, an optical viewfinder with the largest and brightness subject image in its class, a 3.2-inch LCD monitor with 920k dots, built-in dust removal and shake-reduction systems, Dual SD card slots and a USB 3.0 port. The Pentax K-3 is available in black, body only for £1099.99 / $1299.95, in a kit with the 18-55mm WR lens for £1169.99, with the DA L 18-55mm WR and DA L 50-200mm WR lenses for £1349.99, or with the 18-135mm WR zoom for £1419.99 / $1649.95. The K-3 Silver Limited Edition (2,000 units worldwide) will cost £1399.99 / $1599.95 body-only. Optional accessories include a battery grip, FLU card for wireless LAN connection to a compatible smartphone, and a camera strap. 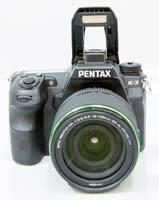 The Pentax K-3 is outwardly very similar to the cheaper K-5 II camera, sharing a lot of the same external design. It's fractionally bigger - 100(H) x 131.5(W) x 77.5(D) - and heavier - 715g without the battery or memory card fitted, but you don't pay too much of a size or weight penalty for choosing the more full-featured K-3. You can instantly tell that the K-3 is a serious camera as soon as you pick it up for the first time. This is mainly due to the K-3's stainless-steel alloy frame and lightweight magnesium-steel alloy body, which is a world away from Pentax's much smaller and lighter entry-level DSLR cameras. The K-3 is dust, cold and water resistant, thanks to a system of 92 special seals used throughout the design, and it can operate at temperatures as low as -10°C. This shows itself most obviously via the battery compartment and the memory card slot. The former is opened via a small rotating latch, which is reassuring but a little fiddly to use if you're in a hurry. The K-3 features a shutter unit which provides a fast top shutter speed of 1/8000th second and an incredible 200,000 shutter release life-span, a figure more commonly associated with much more expensive professional SLR cameras. Rather than an optical anti-aliasing filter in the camera, the K-3 has an innovative anti-aliasing simulator instead, which can be turned off (default setting) or on to either the Type1 or Type2 setting, which adjusts the level of the effect. The smc PENTAX-DA 18-135mm WR F3.5-5.6 ED AL (IF) DC WR lens that we were sent for review along with the K-3 features a simplified weather-resistant construction designed to minimise the intrusion of water and moisture into the lens barrel. There's also a special coating which repels dust, water and grease and makes it easy to wipe off fingerprints and cosmetics. Consequently it feels well-matched to the K-3, although it's a rather slow lens at both ends of the focal length (f3.5-5.6). As it's aimed at the experienced digital SLR owner, the K-3 is a complex camera in terms of functionality and the number of external controls that it offers, with over 30 in total and a lot of them having more than one function. Despite the presence of so many buttons and switches, the Pentax K-3 doesn't feel too cluttered or intimidating, although it will certainly take some time to adapt to for people moving up from a cheaper, simpler DSLR. Departing from the recent trend of ultra-compact SLR models, the K-3 is definitely designed for "normal" hands. The camera has a deep, contoured handgrip on the right-hand side, coated in a rubberized compound to aid grip, that enabled us to use three fingers to hold it and a right forefinger to operate the shutter button. There is a generous contoured area on the rear where your right thumb sits, with the rest of the body finished in a textured matt black. The shutter release action on the Pentax K-3 is very quiet, which makes the K-3 well suited to more candid photography. On the front of the Pentax K-3 is a RAW / FX button, which instantly sets the image quality to whichever RAW format is selected in the menu system (either Pentax's PEF format or Adobe DNG), useful if you are shooting in JPEG and want to quickly switch to RAW mode for a particular image. 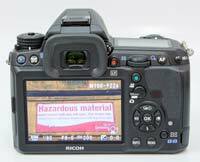 This button can also be customised to optionally control either Exposure Bracketing, Digital Preview, Electronic Level or Composition Adjustment. Located underneath is the Autofocus Mode button, with three available modes (AF-S, AF-A and AF-C), and underneath a switch for changing between manual and auto focusing. Above is a small button for opening the pop-up flash, which extends quite high above the lens to help minimise red-eye. On the bottom of the K-3 is the weather-sealed battery compartment, housing the same rechargeable 1860mAh D-LI90P lithium-ion battery as used by the K-7, K-5 II and K-5 cameras. The K-3 managed around 700 shots using the supplied rechargeable Li-ion battery before being depleted. There's also a metal tripod mount that's perfectly in-line with the centre of the lens mount. On the right-hand side of the K-3 is a weather-sealed SD / SDHC / SDXC dual memory card compartment that's compatible with SDXC UHS-1 speed cards. If you use an optional FLU memory card in the K-3, you can release the K-3's shutter, check the live-view image, and browse and download the images recorded on the card using a smartphone. Note that the FLU card is currently limited to 16Gb in size. Located below is the remote cable release connector. On the left-hand side is a large vertical flap covering the DC In, USB 3.0 and HDMI connectors. The HDMI port allows you to connect the K-3 to a high-def TV set, but only if you purchase an optional HDMI mini-cable. Above this is a small Mic port for connecting an external microphone, protected by a round rubber seal. 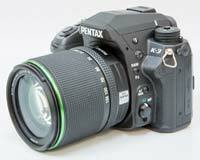 The Pentax K-3 follows conventional DSLR design in having a shooting mode dial on the top-left of the camera, which allows you to select either one of the advanced mode like Aperture-priority, Shutter-Priority and Manual, or the more point-and-shoot Auto and Program modes. There are no scene modes on this camera, signaling its intent as a serious photographic tool. You'll instantly notice that the K-3 has a couple of unusual shooting modes that you won't have seen before on any other camera. These are the Sensitivity-Priority and Shutter & Aperture-Priority modes, and they are genuinely useful additions. Sensitivity-Priority automatically selects the best combination of aperture and shutter speed for your chosen ISO speed. The sensitivity can be shifted instantly (in 1/2 or 1/3 steps) by turning the rear control dial. This allows you to quickly select an ISO speed, without having to access the menu system, which is very useful in rapidly changing light conditions. In the Shutter & Aperture-Priority mode the camera selects the most appropriate ISO speed for a shutter speed and aperture combination, allowing you to use ISO sensitivity as a third factor in determining the correct exposure. 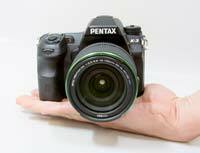 As digital cameras have always offered the unique ability to instantly change the sensitivity, it's surprising that Pentax are still the only manufacturer to allow you to use ISO in this way. At the base of the shooting mode dial is a switch which locks and unlocks the dial. On the right-hand side of the top of the K-3 is the small shutter button, surrounded by the on/off switch. This has a third setting, which by default activates the traditional Depth of Field Preview function, stopping down the lens so that you can see the effect of your chosen aperture. Located in front of the shutter button is one of the e-dials, predominately used to change the shutter speed, while behind it are the Exposure Compensation and ISO buttons - these commonly-used functions are ideally located for easy access. Pentax have retained a traditional top LCD panel which displays quite a comprehensive amount of information about the current camera settings, including the shooting mode, current aperture or shutter speed, flash mode, battery level, number of remaining frames and drive mode. A similar amount of settings are also displayed in the viewfinder. In addition, when you turn the K-3 on or change the shooting mode, a graphical overview of how that mode operates is briefly displayed on the rear LCD screen. The Pentax K-3 does a very good job of providing easily understood information about the settings that it's using. The Pentax K-3 has a traditional eye-level optical TTL viewfinder which offers an impressive 100% scene coverage and 0.95x magnification. Being able to see exactly what will be captured means that you can only blame yourself for poor composition and unwanted details creeping into the frame. The viewfinder is bright and free of any distortions or aberrations, making it suitable for both auto and manual focusing. It also features a Natural-Bright-Matte III focusing screen to improve focusing accuracy during manual-focus operation. The in-finder status LCD runs horizontally along the bottom and it shows most of the camera's key settings. On the rear of the K-3 is a the large 3.2 inch LCD screen. The K-3's LCD screen has a very high resolution of 1,037K dots, wide viewing angle and it's gapless design helps it to remains visible outdoors in all but the brightest of conditions, making it one of the best LCD screens that we've seen on a DSLR. The brightness, saturation and colour temperature of the screen can be modified if you think it doesn't match that of your calibrated computer monitor. The rear screen also doubles as a comprehensive status display, which can be called up by pressing the OK or Info buttons in record mode. If you then press the Info button again, you can also change all the settings right on the screen using a combination of the navigation pad and the rear e-dial. This ingenious solution spares you the pain of having to enter the menu, and makes most setting changes via the LCD screen very simple. 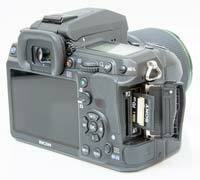 Located above the LCD screen and to the left of the viewfinder are the self-explanatory Play and Delete buttons, the latter doubling up as the Metering mode button. To the right of the viewfinder is the LV button which turns on the K-3's Live View mode (see below for more details). Alongside this is the rear e-dial, mainly used for changing the aperture, a new AF button which can be used instead of half-pressing the shutter button to set autofocus, and the AE-L button, handily placed for locking the exposure. Underneath is a rather innocuous looking button with a small green dot that's unique to Pentax DSLRs. It has two uses - firstly, when shooting in Manual mode, a single push of the green button allows you to instantly set the correct exposure for the subject, as calculated by the camera, useful if you need a starting point for your own exposure. Secondly, the K-3 offers a Hyper Program function which instantly switches to either the Shutter-Priority or Aperture-Priority mode from the Program mode, simply by turning either of the control dials on the grip. Pressing the Green button then returns to the Program mode. The Pentax K-3 has a new switch for changing between stills and movie recording, with the camera automatically switching to Live View for the latter shooting mode. The K-3 can record 1080 HD footage, recording high-definition video at 1920 x 1280 pixels at 60i/50i/30p/25p/24p or 1280 x 720 pixels at 60p/50p/30p/25p/24p in the Motion JPEG (MOV) format. An innovative interval movie mode captures a series of 4K-resolution movie clips (3840 x 2160 pixels) at a fixed interval. The maximum size of a single video clip is either 4 gigabytes or 25 minutes. There's a built-in microphone for stereo recording, a socket for connecting an external stereo microphone and a headphone terminal. You can adjust the audio recording level manually and monitor sound levels during microphone recording. It also has an HDMI port for playback on a HD TV, using the industry-standard HDMI mini-out connection, but note that you'll need to purchase a suitable cable separately. You can also still connect the K-3 to a standard TV set via NTSC/PAL. Importantly you can now autofocus during movie recording, bringing the K-3 in-line with its main rivals. Unfortunately you can't set the aperture from the camera during recording, only before, so you will want to use lenses that have an aperture ring if possible. The K-3 can be set to Auto Aperture Control, which removes the flexibility of being able to set the aperture yourself but at least enables the camera to change it during recording to suit the subject matter. The shutter speed cannot be set by the user in movie mode either, so you will have to rely on the camera's auto-exposure system while filming. To engage Live View for stills, you have to set this switch to the Camera icon, then press the red LV button. You can use the Live View mode to hold the K-3 at arm's length or mount the camera on a tripod, with a single press of the LV button on the rear displaying the current scene on the LCD screen. Focusing is achieved by pressing the small AF button on the rear of the camera or by half-pressing the shutter-button. Alternatively you can use manual focus in Live View mode, with up to 10x magnification available via the OK button to help you fine-tune the focus (you can also use the OK button to magnify the subject by up to 10x when Auto Focus is on). Most of the main camera settings are displayed in Live View, including a helpful electronic level that helps to keep your horizons straight, although a histogram is still conspicuous by its absence. You can change the aperture, shutter speed, exposure compensation, ISO speed and a number of other settings when Live View is activated. Live View is fine for use with stationary subjects, but forget it if you want to track a moving subject. The AF system in Live View mode takes a couple of seconds to lock onto the subject, making it much better suited to subjects that don't move. The Face Recognition AF mode works quite well, as promised quickly identifying up to 16 people in the frame, but again it takes a couple of seconds to lock onto a non-moving subject. More impressively Live View can be used in the continuous shooting mode with no restrictions on the 8.3fps rate, as the K-3 sets the mirror to the lock-up position. A traditional 4-way navigation pad is split into separate buttons, providing instant access to the drive mode/self-timer, custom image, flash and white balance settings, with the OK button confirming actions. The Menu button underneath accesses all of the 90+ different menu options that the camera offers, reflecting the fact that this a complex and very customisable DSLR. Thankfully you will only have to set about half of the settings once and can then forget about them. The menu system has a fairly logical tabbed system with five main tabs, Camera, Movie, Playback, Set-Up and Custom Setting, each divided into several sub-pages, and it's easily readable with a bright display and a large font size making it perfectly visible even in low light. In addition to the Info button that we've already mentioned, the Pentax K-3 has a new Autofocus Area button which allows you to quickly set the AF point to one of the 27 available. Impressively 25 of these are cross-type sensors positioned in the middle, with the centre sensor and two sensors just above and below it designed to detect the light flux of an F2.8 lens. In Playback mode this allows you to toggle between the dual SD cards. 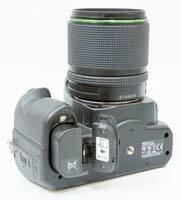 The Pentax K-3 features a built-in Shake Reduction system. Turn it on via the main menu option and the K-3 automatically compensates for camera shake, which is a slight blurring of the image that typically occurs at slow shutter speeds, providing approximately 3 shutter steps of compensation. As this system is built-into the camera body, it works with almost any lens that you attach to the K-3, providing a significant cost advantage over DSLRs from Canon and Nikon, which use a lens-based image stabilisation system (compatible lenses are the PENTAX K-, KA-, KAF-, KAF2- and KAF3-mount lenses; screw-mounted lenses (with an adapter); and 645- and 67-system lenses (with an adapter)). The K-3 displays a blur icon in the viewfinder to warn you that camera-shake may occur, regardless of whether or not Shake Reduction is on. If you've had a bad experience with DSLRs and dust in the past, then the K-3 offers a Dust Removal mechanism. This automatically shifts the low-pass filter located in front of the CMOS image sensor at very high speed, shaking the dust off the low-pass filter. If you do still notice any dust, there's a neat feature called Dust Alert which is designed to show exactly where the dust is on the image sensor. A vertically and laterally correct image of the sensor shot at f/16 is shown on the LCD screen, indicate exactly where any stubborn dust particles may be lurking. While this feature won't prevent dust from getting onto the sensor, it does provide a quick and easy way of checking for it. In addition Dust Removal can be set to activate whenever the camera is turned on, and you can also use the built-in Sensor Cleaning function to lift the mirror and clean the image sensor with a blower brush or third-party cleaning solution. The Pentax K-3's High Dynamic Range (HDR) Capture option takes three images with different exposures, with 3 different strengths on offer, and then records a single image that combines the properly exposed parts of each one, expanding its dynamic range. It's important to always use a tripod to prevent camera shake from blurring the HDR image, and it doesn't work very well for moving subjects. Similar to Nikon's D-lighting, Sony's DRO, and Olympus' Shadow Adjustment Technology, Pentax's D-Range allows you to correct the highlights (On or Off) and/or the shadows (3 different levels) before taking a JPEG or RAW image. Although this option is always at your disposal, remember that it is meant to be used in strong, contrasty lighting at base ISO. The Pentax K-3 also has a multi-exposure mode that allows you to combine between two and 2,000(!) different JPEG or RAW images into a single photo and a Cross Processing mode with four built-in effects and custom options that replicates the traditional effect of cross-processing film. Pentax's Custom Images, similar to Nikon's Picture Styles and Canon's Picture Controls, are preset combinations of different sharpness, contrast, saturation and colour tone settings. You can change the saturation, hue, high/low key, contrast and sharpness for each of the ten options”. The Pentax K-3 additionally offers eight different Digital Filters, which allow you to quickly apply an artistic effect to a photo before taking it (JPEG images only). Note that applying the Digital Filters slows the camera down somewhat, as it has to process the image for a few seconds after it's taken. The K-3 can also be set to automatically compensate for both distortion and lateral chromatic aberration of any DA- and DFA-series lenses. The rather innocuous-sounding AF Adjustment custom function will be of particular interest to current Pentax owners. If you have a collection of older Pentax lenses and you've never been quite sure how accurate they focus when mounted on a DSLR, this is the function for you. Essentially it allows you to alter the focus of each lens. You can use a focusing target to test if the lens focuses correctly, and if it doesn't alter it slightly using the AF Adjustment option, then test again until perfect focus is achieved. With most other DSLR systems you'd have to send the camera and lens off for calibration (and maybe even have to pay for it), but with the K-3, you can calibrate all of your lenses in the comfort of your own home. 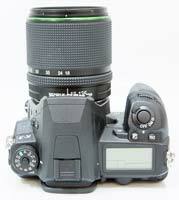 The start-up time of the Pentax K-3, from turning the camera on to being ready to take a photo, is very quick for at around 1 second. Focusing is much quicker than the older K-5 model even in low-light thanks to the newly developed, highly sensitive SAFOX X AF module and an upgraded AF algorithm. 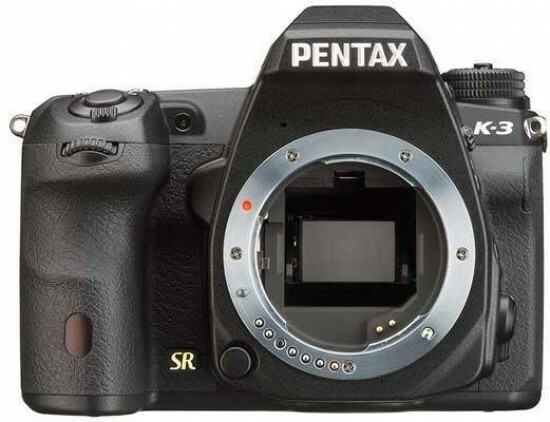 The auto-focus performance of previous Pentax DSLRs has always suffered slightly in comparison with their rivals, but we're pleased to report that the near-instant focusing of the K-3 should finally dispel those criticisms. Indeed, Pentax claims that the K-3 has the largest working range of any DSLR on the market (-3 EV to +18 EV) and this was certainly borne out in practice, even with the slow 18-55mm kit lens. Note that the 18-55mm lens has an annoyingly loud focusing mechanism though. The powerful AF Assist lamp can be used even if the built-in flash isn't raised. It takes about 1 second to store a JPEG image at the highest quality setting with no discernible lockup between taking shots, allowing you to keep shooting as they are being recorded onto the memory card. For RAW images the Pentax K-3 takes about 2 seconds to store an image and again there is no lockup between shots. In the continuous shooting mode you can hold down the shutter button and take 8.3 shots per second for up to 60 JPEGS or 23 RAW files an impressive performance given the large 24 megapixel files that this camera produces. The K-3 does lock up for a few seconds once the maximum number of shots is reached, although you can continue to shoot continuously, just at a much slower rate. Once you have captured a photo, the Pentax K-3 has a good range of options for playing, reviewing and managing your images. You can instantly scroll through the images that you have taken, view 12 thumbnails, zoom in and out up to a magnification of 16x, and see very detailed information about each image by pressing the Info button. You can also delete, rotate, resize, protect and crop an an image, view a slideshow and set various printing options. There is an extensive range of 19 digital effects available which can be applied to JPEGs plus a Custom option to create your own unique effect. The camera shows you a preview of what the effect will look like when applied, and the effect is applied to a copy of your image, thus preserving the original intact. The Index option creates an index print from up to 36 images. Save as Manual WB sets the camera's Manual White Balance setting to the colour balance of the current image and Save Cross Processing saves that specific setting as a favourite. Color Moire Correction reduces colour moire and RAW Development converts a RAW file into a JPEG or TIFF with various conversion parameters available. Movie Edit lets you divide or extract segments from your movies. Importantly the Pentax K-3 offers both a brightness and RGB histogram after taking a photo which is a great help in evaluating the exposure, plus any areas that are over-exposed flash on and off in the LCD preview to show you want you should be compensating for with your next attempt. If you have never used a digital camera before, or you're upgrading from a more basic model, reading the comprehensive but relatively easy-to-follow manual before you start is a good idea. Thankfully Pentax have chosen to supply it in printed format, rather than as a PDF on a CD, so you can also carry it with you for easy reference.